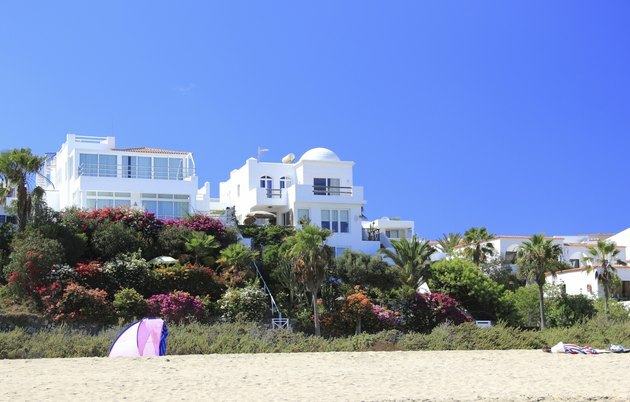 If you've ever traveled to Mexico, whether you went to a beach resort town or a modern urban area, you probably noticed the various types of Mexican homes, and saw that Mexican architecture has influenced many American homes. 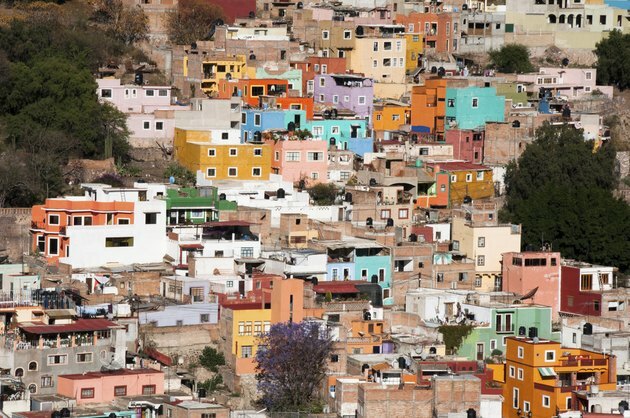 There are several different styles of Mexican homes, each with distinct characteristics, materials and colors. Many Mexican homes are dramatically influenced by the Latin country's long history with Spain. These types of homes are also very popular in the U.S. White stucco walls and red tile roofs typically characterize the Spanish villa style. These homes typically have several arched and rounded windows, and their doors are usually wooden. Most of them have interior tile floors and utilize dark blue tile in the bathrooms and kitchens. Some of these types of homes have interior, tiled courtyards with elaborate gardens and fountains. 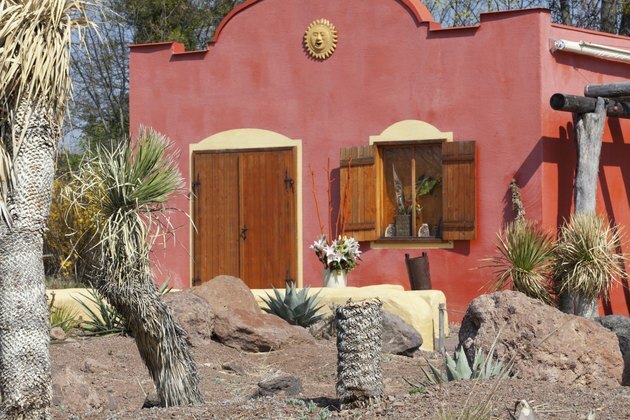 Mission-style homes, inspired by 18th century Spanish church architecture, are found throughout Mexico as well as in Florida, Arizona, California, Nevada, New Mexico and Texas. Some telltale markings of these types of homes are their parapets, bell towers and dormers. They typically have stone or stucco walls, red tile roofs and arched ceilings and walkways. They often feature elaborate interior designs using bright colors like reds, blues and yellows. Many of Mexico's large cities, such as Mexico City and Guadalajara, feature modern adobe houses in the downtown urban areas. This style is also found throughout the Caribbean region of Mexico, as well as in Santa Fe and Taos. The modern adobe style was influenced by Mexican Native American cultures, and modern versions usually have several levels of patios covered by wooden trellises. These homes are made from adobe or stucco, and have flat roofs and vigas that protrude from the exterior walls. Many of them have tile floors and brick or wooden ceilings. Abode homes are popular in hot climates because they typically have small windows and stay cool. 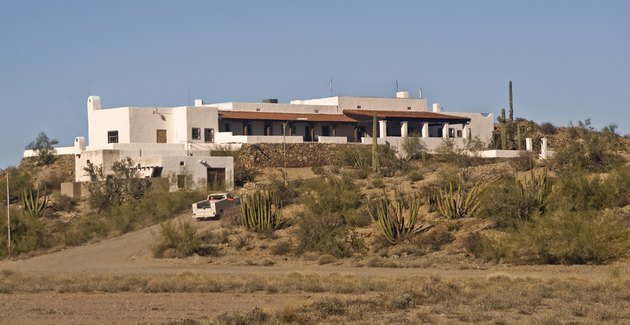 Hacienda ranch-style homes are found throughout Mexico and in the U.S. Southwest. These one-story houses are usually large and spread out over a large property. Traditional hacienda houses don't have an open layout; each room is separate from the others. They typically boast a large fireplace in the family room and separate dining and kitchen areas. Most of these types of homes feature tile floors, brick fireplaces and outdoor patios or courtyards.